Ah the evils of We should Cocoa. 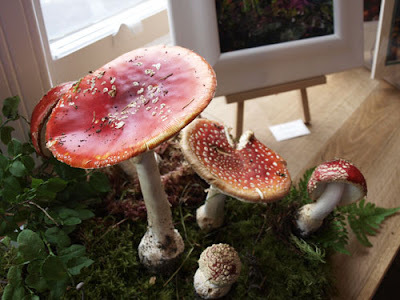 I was checking out the entry by Cake, Crumbs and Cooking and saw these amazing flapjacks. They have so much fat and sugar in them, they should really only be available on prescription for very thin people! Thing is, my friend was coming for lunch and the trouble with being a food blogger is that people who know about your blog expect very high standards of home cooking and baking! So I had to make something and somehow I was drawn to these. Of course, being me, things didn't go quite according to plan. When I went to my larder I found that the small tin of condensed milk I had in there, wasn't! It was a tin of dulce de lecce. I did have a huge tin of condensed milk which I bought by mistake when on-line shopping, but I didn't want to open it because I really don't need to have that sitting around waiting to be used up. So, as previously mentioned, it's five miles to the shops so I just used the Dulce de Lecce, its only boiled up condensed milk anyway, so I figured it would work...and it did! I also used raisins instead of dried cranberries, v. tasty. 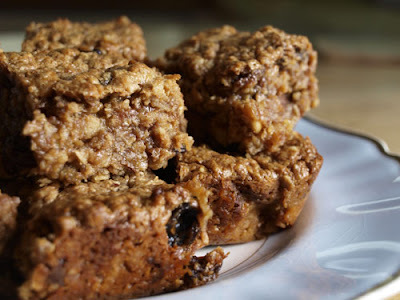 The flapjacks are sweet, chewy and absolutely delicious. Cut into small squares as they are very rich. And of course, when my friend arrived, she had brought some chocolate chip cookies that she had made for me! Nice to receive some home baking, thanks! 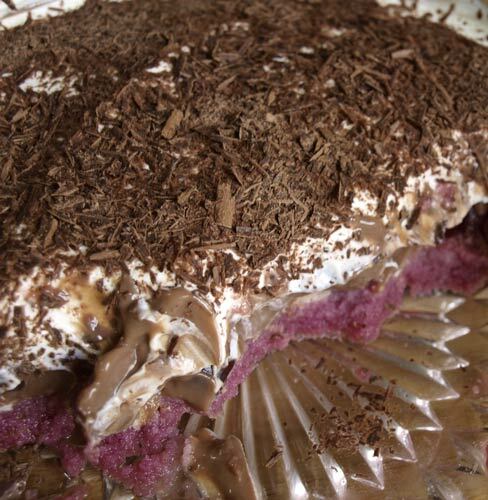 Thanks too, to Cake, Crumbs and Cooking for pointing me in the direction of this great recipe! Christmas is THE ulitmate foodie fest, somehow food has become central to the festivities and although we understand the meaning of Christmas, in our increasingly secular world it's the food and the gifts that are the focus rather than the religion. 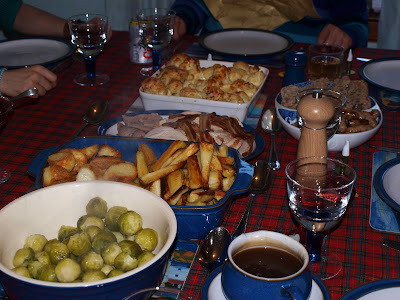 So for many of us, getting the Christmas lunch or dinner right is very, very important and it's when that pressure is applied that there just might be the chance that things don't quite go as planned. I am fortunate that I can't remember anything going horribly wrong at Christmas. I write out my lists, prepare as much in advance as possible and have the advantage of being brought up by a mother who was an excellent cook! 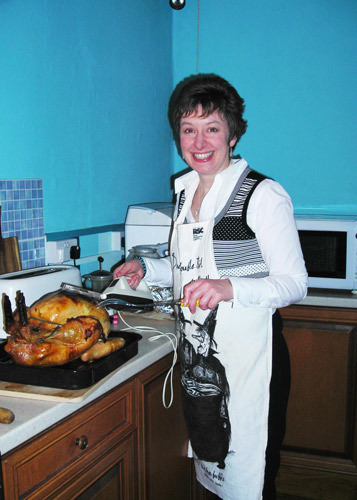 Don't get me wrong, I have had my share of disasters but just not on Christmas Day! 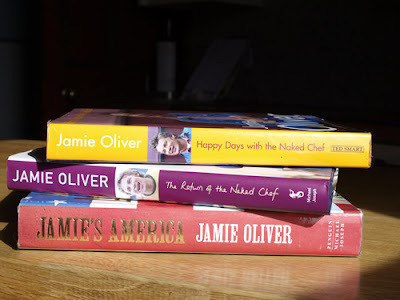 While this might be good news for my family, it does rather rule me out of getting on TV as part of Jamie Oliver's latest TV show...so if you have had a Christmas dinner disaster - it might be your lucky day! Christmas dinner can often be a recipe for disaster. Botched Brussels, dropped desserts, scorched birds, food poisoned in-laws... most of us have had our share of kitchen calamities at Christmas! Whatever the mishap, from the funny to the tragic, and the stressful to the very familiar – we want to hear your stories. And Jamie will help guide us through the worst of it, plying us with tips and tricks and lots of laughs along the way. This is the show to make your Christmas go with less of a BANG! 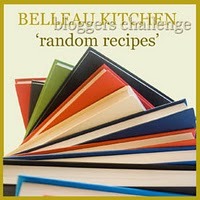 There is something about the Random Recipes challenge that brings out the worst in me! Perhaps it's something about losing control -eek! I'm not noted for being a hang loose, devil may care, kind of girl. However, I am fiercely competitive and a bit of a risk taker (only calculated risks, you understand) so I'm drawn to Random Recipes, just to see what it will throw at me. 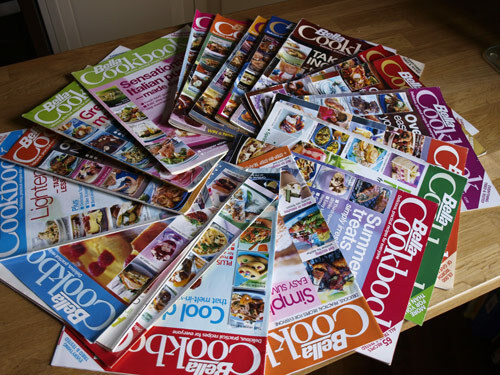 This month Dom has decided that we should look at our magazine collections and cuttings for our random recipes. I had to decide whether I went for my folders of cuttings or the mags. Having just given a year's worth of Good Food Mags to my younger son (also a bit of a foodie and a good cook) I couldn't go there. The folders would have been fine, but I felt it was too easy to cheat as the pages aren't numbered. 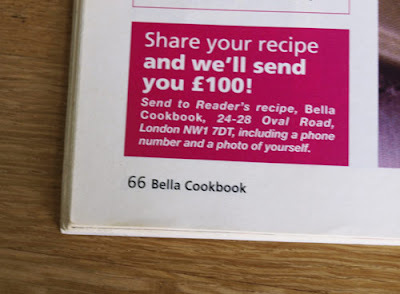 So I turned to my collection of Bella Cookbooks. Sadly Bella Cookbook is now defunct but was a great little magazine full of everyday recipes that you wanted to cook. So I spread the magazines out, there were 19, and used the Random number generator and came up with the number 6. So this was magazine no. 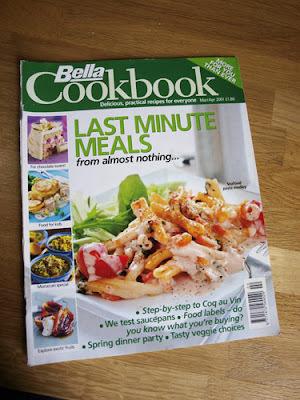 6, March April 2001 - Last Minute Meals from almost nothing - that sounds good! 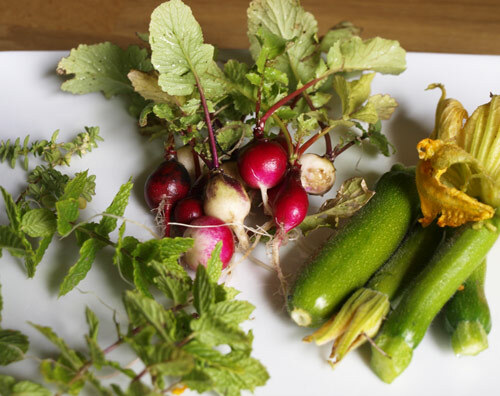 Step by Step to Coq au Vin, Spring Dinner Party and Tasty veggie choices. Okay, looking promising. See I told you Random Recipes brought out the worst in me... now I'm cooking with the devil lol! 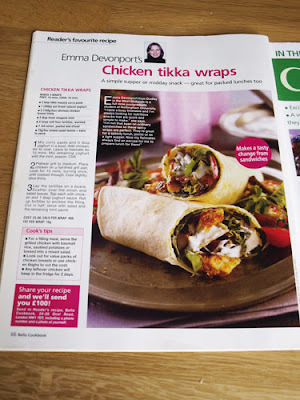 So the recipe on page 66 was for Chicken Tikka Wraps, I think I like this devilish recipe, especially as I had some chicken breasts defrosting in the fridge - or so I thought! But I didn't have any wraps and I'd already been for my shopping. It's five miles to the nearest shop from where I live so I thought I'd have a go at making my own wraps. 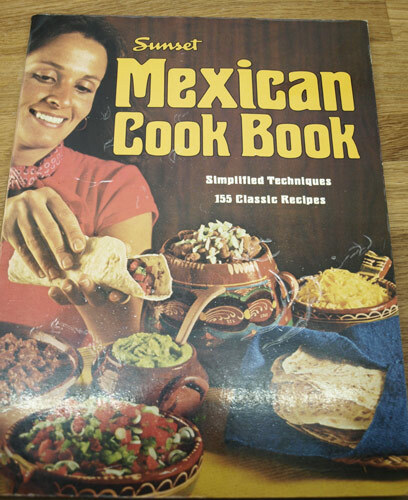 I bought my Sunset Mexican Cookbook when I first went to California in 1980, it's a great little book. Definitely more tex-mex than genuine Mexican, but none the worse for that. And it has a recipe for Tortillas which is pretty easy. Stir together flour, baking powder and salt. 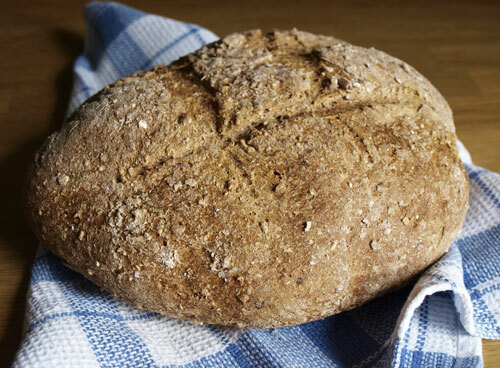 Gradually stir in enough warm water to form a crumbly dough; then work dough with your hands until it holds together. Turn out onto a board and knead until smooth. Divide into 12 (I did 8 pieces) and shape each into a smooth ball. Cover lightly with plastic film and let rest about 15 minutes. For each tortilla, flatten one ball into a 4 or 5 inch patty, then roll into about a 9 inch round, rolling from centre to edges. 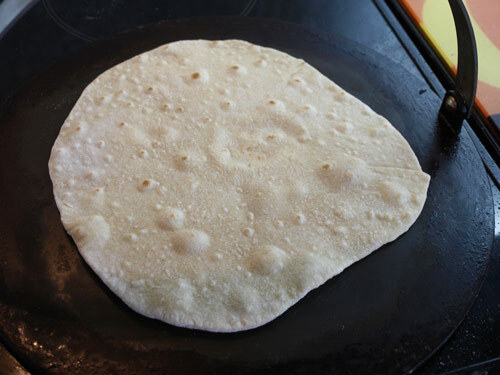 Turn tortilla often, stretching dough as you carefully peel it of board. As each tortilla is shaped, place on a preheated, dry heavy girdle or frying pan over a medium high heat. Almost immediately, tiny blisters should appear. Turn tortilla and immediately start pressing a wide spatula directly on to of it - press gently but firmly all over the top. Blisters will form over most of surface as you press. Turn tortilla and press all over other side until blisters turn a golden brown' tortilla should remain soft. If tortillas stick or brown too quickly; reduce heat. Stack tortillas as cooked inside a folded cloth towel within a plastic bag; close bag and let tortillas steam and soften until all are cooked. Serve tortillas as soon as they are soft; or cook, remove from bag, wrap in foil, and refrigerate or freeze. But that isn't the random recipe, just a means to an end, you see how distracted I have become! When I went to get my 'chicken breasts' out of the fridge, I realised that although I had considered defrosting chicken the night before, in the end I had decided to defrost a couple of lamb steaks and then promptly forgot! However, I decided to carry on with the lamb anyway. 1. Mix curry paste and 3 tbsp yogurt in a bowl. Add chicken; stir to coat. Leave to marinate for 10 minutes. Mix remaining yogurt with the mint; season. Chill. 2. Preheat grill to medium. Place chicken on a foil-lined grill pan; cook for 15 mins, turning once, until cooked through. Cool slightly; slice thinly. 3. Lay the tortillas on a baord. 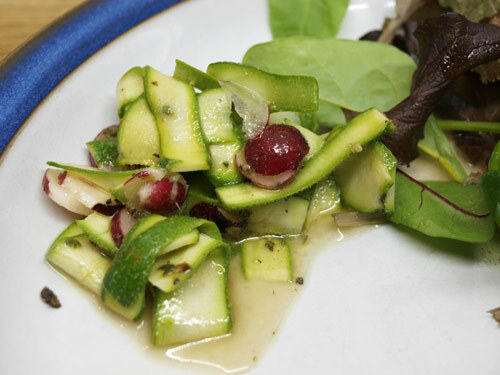 Scatter over the onion and salad leaves. Top each with chicken and 1 tbsp yogurt sauce. Roll up tortillas to enlose the filling. Cut in half; serve with salad and the remaining mint sauce. 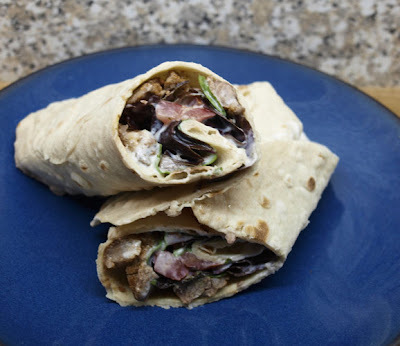 So there we go, my 666 Lamb Tikka Wraps with homemade Tortillas. The lamb worked really well, it was tender and delicious. The tortillas were slightly more chewy than the one's you buy in the supermarket, but overall they were really good and I would definitely make my own again. I entered a giveaway on The Kitchen Maid blog to celebrate the 1st Birthday of Lucy's blog. There were loads of prizes and I was lucky enough to win two bars of Whittakers Dark Almond Chocolate. 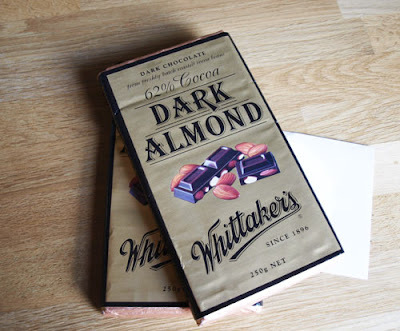 I arrived home today to a parcel from New Zealand and there were my two giant bars of choc! It's a long way from New Zealand but the chocolate had survived very well. Possibly due to the fact that these aren't your wimpy thin bars like the ones we get here. These are great big slabs of thick, dark chocolate absolutely stuffed with almonds. Obviously we had to sample it in order to tell you what it was like, well it would be rude not to. So what is it like? To be honest, my first thought was that it tasted just like French and German chocolate, dark and not too sweet. Mr Farmer was particularly taken with it and I can see that I am going to have to hide it away or he will be eating it at every opportunity! Thank you very much Lucy, it's so nice when giveaways are open to people all over the world and you get a chance to taste something new and different. 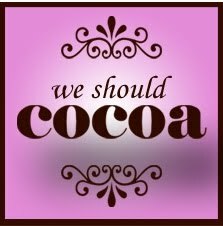 'We should Cocoa' is celebrating a year of chocolate challenges by asking us to create a dish worthy of a 1st birthday party. 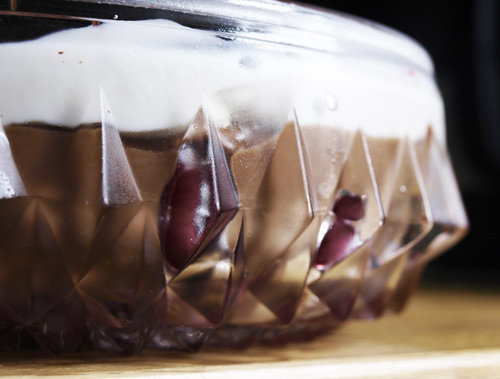 Find out more over at Chocolate Teapot Now, as far as I am concerned, no party is complete without a luscious trifle. I really did cheat quite a lot with this trifle, but it is delicious for all that. 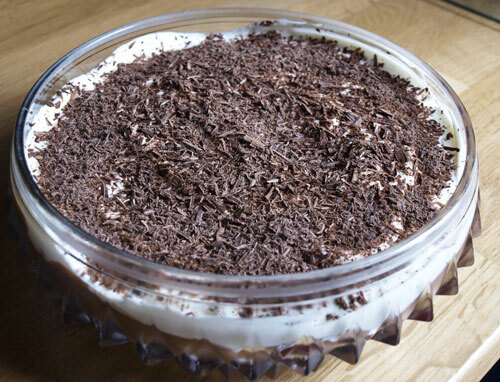 No recipe - who needs a recipe for trifle? Here are some vague instructions instead - hee hee! 1. Fill the bottom of your trifle bowl with boudoir fingers, trifle sponges or any kind of sponge cake. 2. Open a tin of cherries in light syrup, pour the juice over the cake. Take the stones out of cherries, don't worry if they look a bit of a mess, this is a trifle! Put the cherries on top of the soaked cake. You could add some cherry brandy at this stage if you want. 3. Take a tub of bought fresh custard, warm it gently in a pan. Finely chop about 80-100g of dark chocolate, add to the custard and stir until it is all melted. Take the custard off the heat and let it cool for about 5 mintues, then spoon it over the cake and cherries. 4. Put it in the fridge to cool completely. 5. 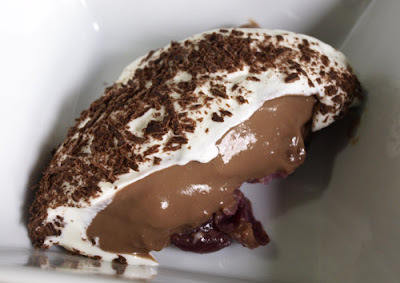 Mix together about 150g Greek Yogurt and 150g Creme Fraiche with a teaspoon of caster sugar. Spread it evening over the chocolate custard. 6. Decorate with the grated chocolate. I've fallen in love with Tamasin Day-Lewis's book 'Supper for a Song', in fact, I have it on order from Amazon and can't wait for my copy to arrive, then I will be able to return the library copy for someone else to enjoy. 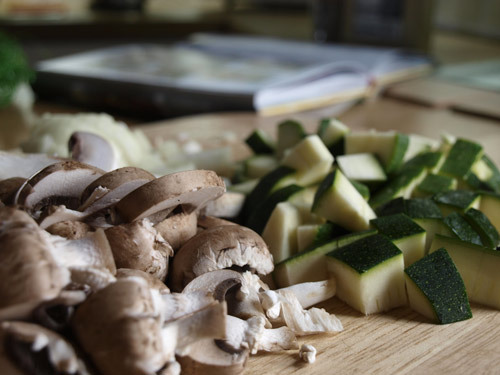 This recipe for Autumn Vegetable Lasagne caught my eye right away, because of course it is Autumn and I'm on a bit of a mushroom kick after the 'Art of Funghi' session I went to recently. 20g/3/4oz dried sliced morels, soaked in warm water to cover for 30 minutes and drained (optional) I didn't use these, but included some ordinary field mushrooms. Preheat the oven to 200C/Gas 6. Heat 1 tbsp of the olive oil in a small pan and cook the sliced mushrooms until they begin to release their juice. 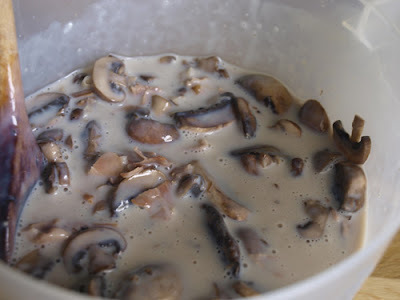 Add the morels (if using) with their soaking liquor, and the Marsala and simmer for 5 minutes. Remove from the heat. To make the bechamel sauce: heat the milk with the bay leaf in a pan. Melt the butter in another pan, stir in the flour and cook for a minute or so until you have a biscuit coloured roux, then add a quarter of the hot milk and whisk until smooth. Continue to add the milk a little at a time whisking well. Season and flavour sparingly with nutmeg. Ad the liquor from the mushrooms and let the sauce cook gently for a further 15 minutes, stirring from time to time. Adjust the seasoning. 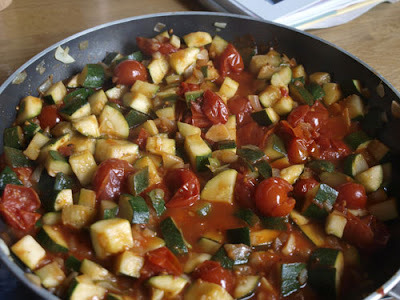 Meanwhile, saute the onion and garlic in the remaining olive oil with a sprinkle of salt until they begin to soften, then add the courgette cubes and cook until they are al dente. Add the tomatoes and torn basil and simmer the mixture for 10 minutes. Season with pepper. 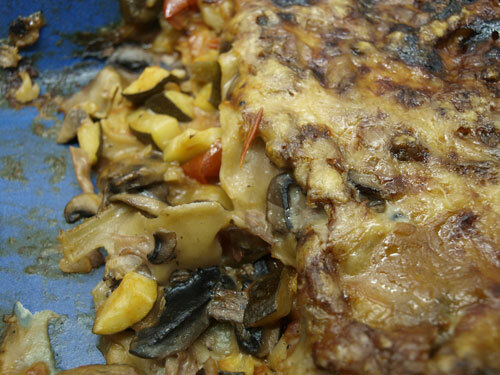 Add the mushrooms to the bechamel. Heat the prosciutto strips briefly in the pan used to cook the mushrooms with no extra oil, turning until they begin to crisp a little then add to the mushroom sauce mixture. Cook the lasagne sheets, according to the packet instructions, until al dente, then drain in a colander. Spread a little bechamel, avoiding the bits, over the bottom of a large baking dish, then add a layer of lasagne sheets. Cover with half of the remaining bechamel mixture. Add another layer of lasagne, followed by the last of the bechamel mixture. Top with the grated cheese. 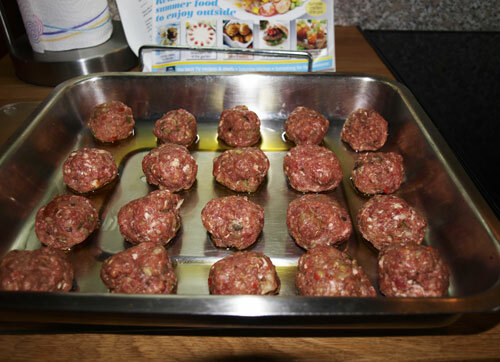 Bake for 30 minutes or until golden and bubbling, and a skewer inserted in the centre meets with little resistance from the lasagne. Leave to stand for 10 minutes before serving; this is one of those dishes that seems to stay hotter for longer. I completely forgot to take a picture of the lasagne before I served it up, so all I have is a photo of the half that was left in the dish. 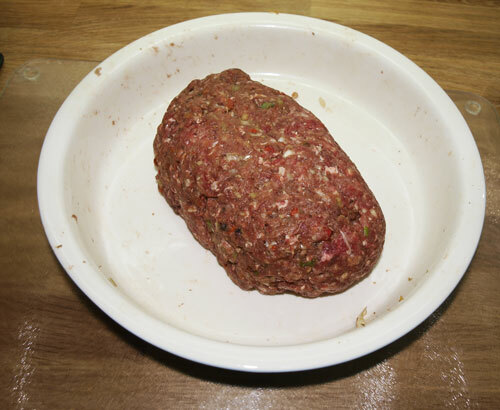 It served 8 easily with salad and was really delicious, it was also great reheated. 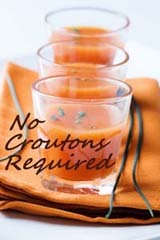 I'm entering this as my bookmarked recipe for this month. The challenge is hosted by Tinned Tomatoes from an idea from Ruth's Kitchen Experiments. It's quite a recent bookmark as I only got the Tamasin Day-Lewis book 'Supper for a song' from the library a couple of weeks ago, but straight away I knew I wanted to make this relish or jam as she calls it. Chop the whole fresh tomatoes into small dice and set aside. 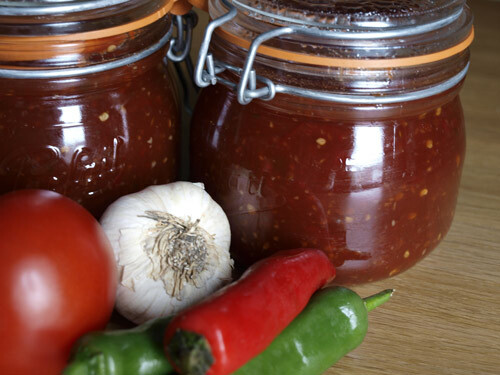 Put the tinned tomatoes into the food processor with the chillies and their seeds, garlic, ginger and fish sauce and blitz into a fine puree. Spoon the puree into a deep, heavy-bottomed pan and add the sugar and wine vinegar. Bring to the boil slowly, stirring as you go. When it comes to the boil, turn down to a simmer and add the diced tomatoes. Skim off any foam that rises to the surface and cook gently for up to 1 1/2 hours, stirring from time to time, to prevent the mixture catching and burning. Scrape the sides of the pot too, so that everything cooks evenly. 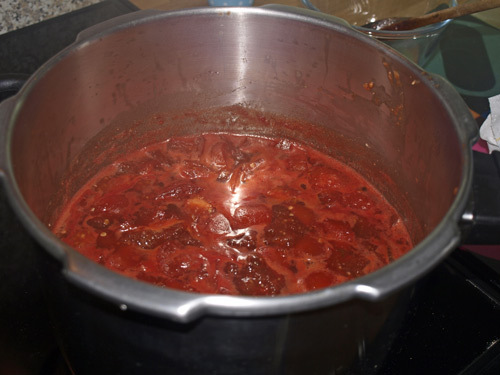 The mixture thickens as it cooks - as it reduces and the pectin in the tomatoes takes effect. 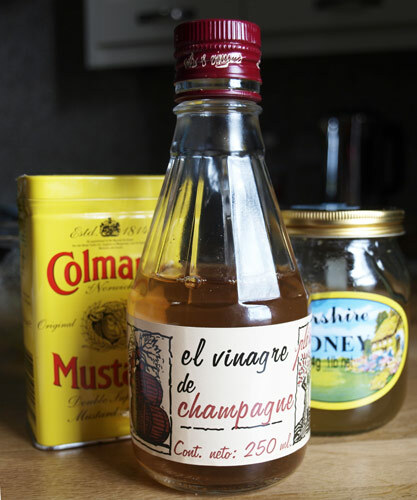 When the mixture seem thick to the stir of a wooden spoon, decant it into warm, sterilised jars and seal. 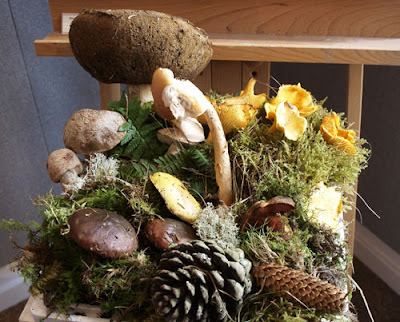 Store in a larder or cool place, not the fridge, for up to 9 months. I had a little taste and, boy is it hot! I hope it is going to mature nicely as I have forbidden Mr Farmer from trying it yet, as he would put it on everything and it would soon be gone. 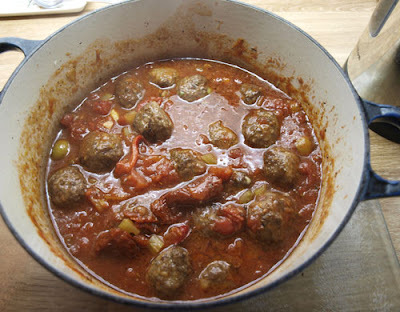 I got two Kilner jars and a small jar from this recipe. I may try and make it again using only tinned tomatoes, I've made tomato chutney with tinned toms before and you get a brilliant colour and as you are cooking the tomatoes anyway there is no real difference in taste although the fresh toms give a bit more texture. I'm entering this in the 'Homemade and Well Preserved" challenge hosted by Sue at A little bit of Heavan on a plate. 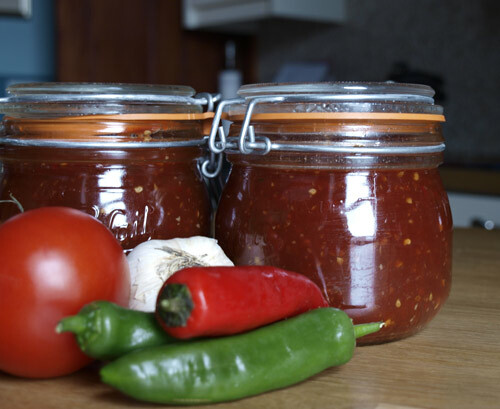 Labels: chilli, garlic, preserves, root ginger, tomatoes, wine vinegar. I got one of those 'lure you in' vouchers from Tesco last week: Spend £40 and get £6 off your bill. So instead of shopping online I actually went into the Tesco store. This is usually a mistake as I tend to end up spending much more than when I shop online, but it does give me an opportunity to see what is there and get something different. I was planning on having salmon fillets for supper tonight so headed ot the fresh fish counter. I did get the salmon fillets (reduced too!) but I was really surprised to see the variety of fish on offer, more than I had seen previously. I saw Tilapia, Sea Bass, Mackerel and various less well known white fish, which I assume must be there for sustainabilty. Now those of you who live in towns and cities will be thinking I must have lost the plot, but when you live in rural Scotland your fish choice is usually, haddock, cod, whiting, smoked haddock and smoked mackerel with the odd herring thrown in. Our little town just doesn't have a big enough population to support a fish shop, there are some vans that go around but they only have the fish I mentioned above and, even in the larger towns nearby, I have never seen Cornish Sardines. The woman at the counter said she only had five left so would give me a discount, they were only 35p each, how fab is that! So I brought them home and only then did I think "what on earth am I going to do with five Cornish Sardines?" 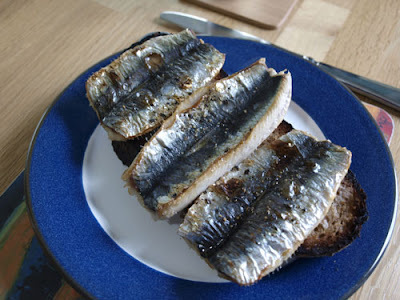 A quick search on the tinternet and I found this fab site and this recipe for Cornish Sardine Bruschetta. 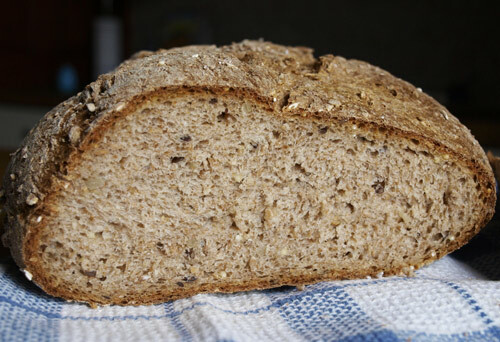 The loaf I made yesterday was ideal for Bruschetta, so we had this for lunch. The sardines were delicious but they don't half stink up your kitchen! So, in defense of Tesco: don't tell me that without Tesco in the town all these small shops would thrive. I've lived in this area for 26 years and when I arrived we had a very poor selection of fruit, veg, fish and pretty much everything else except meat (there were three butchers in this small town) there is an awful lot to be said for the variety and choice that supermarkets deliver. Chuck it all in the bread machine on dough setting, when it is mixed, place on a baking tray. Leave to rise for a further 20 minutes, then bake at 180C for 30-40 minutes until the loaf sounds hollow when you tap the base. 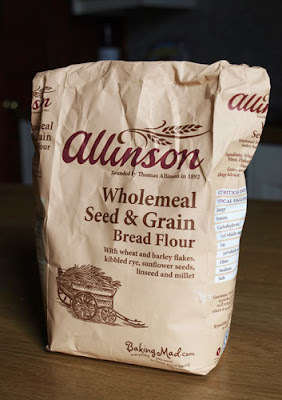 The loaf turned out well, I think I might make some scones with the rest of this flour, I think they would be rather tasty.